After lunch most afternoons when we have no plans, I have tried to prepare some sort of sensory play activity. 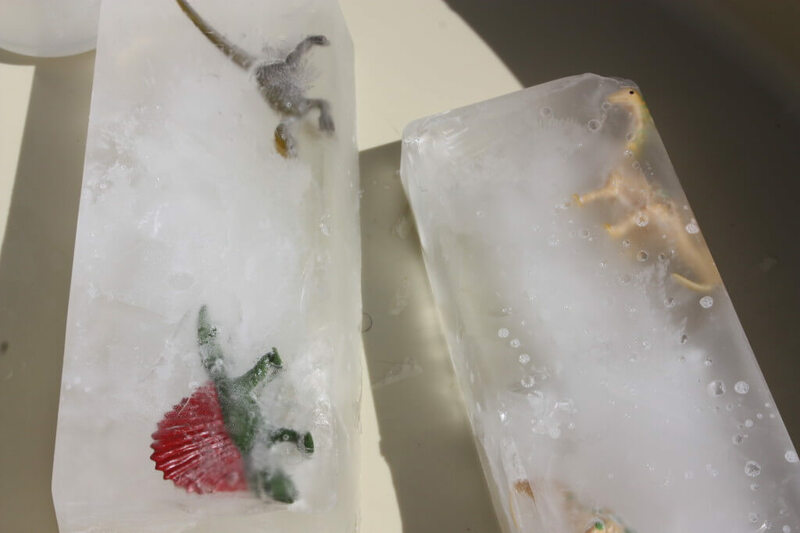 This time I thought ahead (something I am trying to work on every day) and froze a bunch of dinosaurs in ice blocks. First I tried water balloons since I had seen the idea for making eggs, but my dinosaurs were not about to fit into these water balloons. Even better, my dollar store deviled egg tray! Perfect little 1/2 eggs! So in the freezer, I had two brick shaped containers and the tray freezing with my little dinos all for our sensory play the next day. He was super excited to help me set up the sensory play table and see what we were going to do with the dinosaurs. Again, he loves to help with the set up of his projects. He enjoys it more than actually play time with the table, so I really try to draw out the process and think of extra ways to have him help. Luckily, the table needed to be cleaned out and hosed down and then he helped me make trips back and forth to the house to get things and fill up warm water jugs. Here is our end set up. I filled a shaker full of salt and two squirt bottles with very warm water. I really had no idea what to expect in terms of melting time and interest level. At first he enjoyed handling them and looking at the frozen dinosaurs. 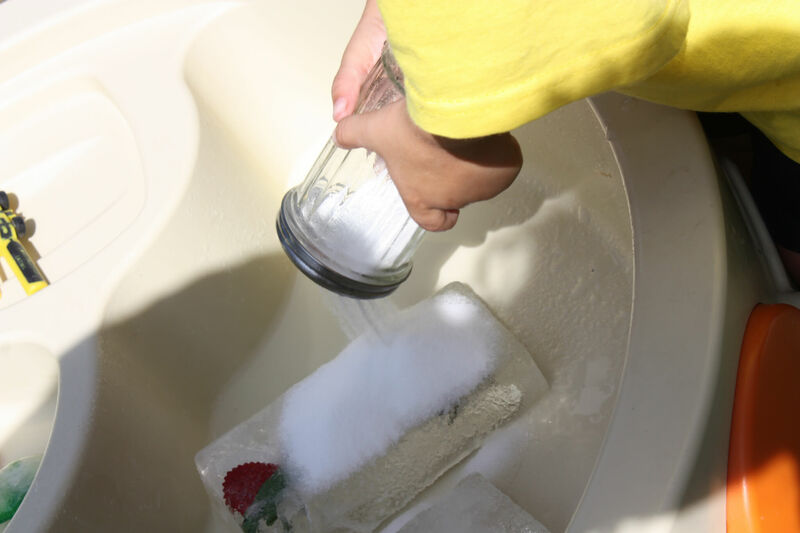 Then we started squirting warm water and I showed him how salt helps to melt ice. We dumped and squirted, refilled and did it again. 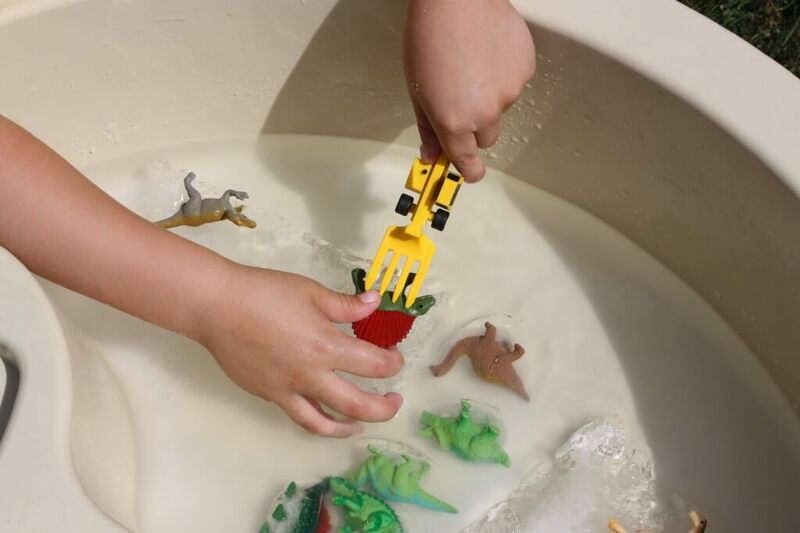 He scraped away at the blocks with his excavation tools (his toddler utensils) and eventually the dinosaurs started to appear out of the ice. One more trip with warm water did the trick. After all the dinosaurs came “alive”, he pretended that they were in a big pool and he filled the empty shaker with water and gave them showers. 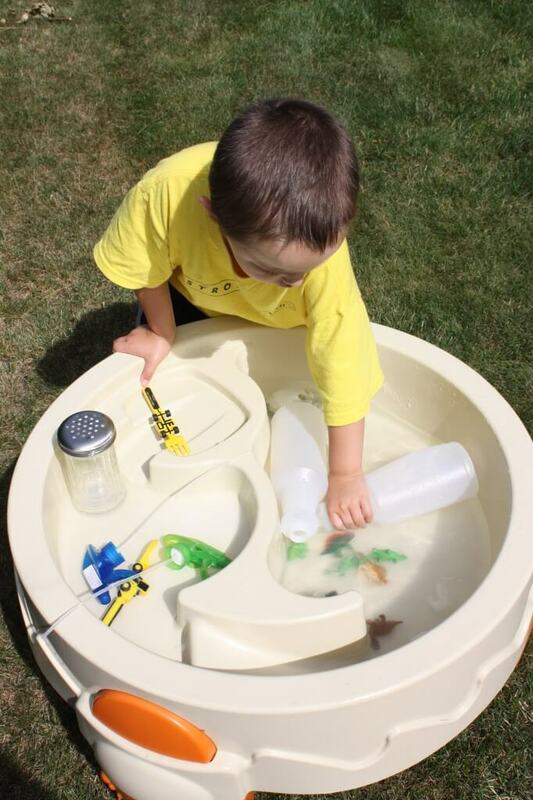 This water table has proven to be really useful for sensory play. I imagine I have the toys that came with it somewhere, but our sensory play is so much more fun and totally easily to clean up outside! 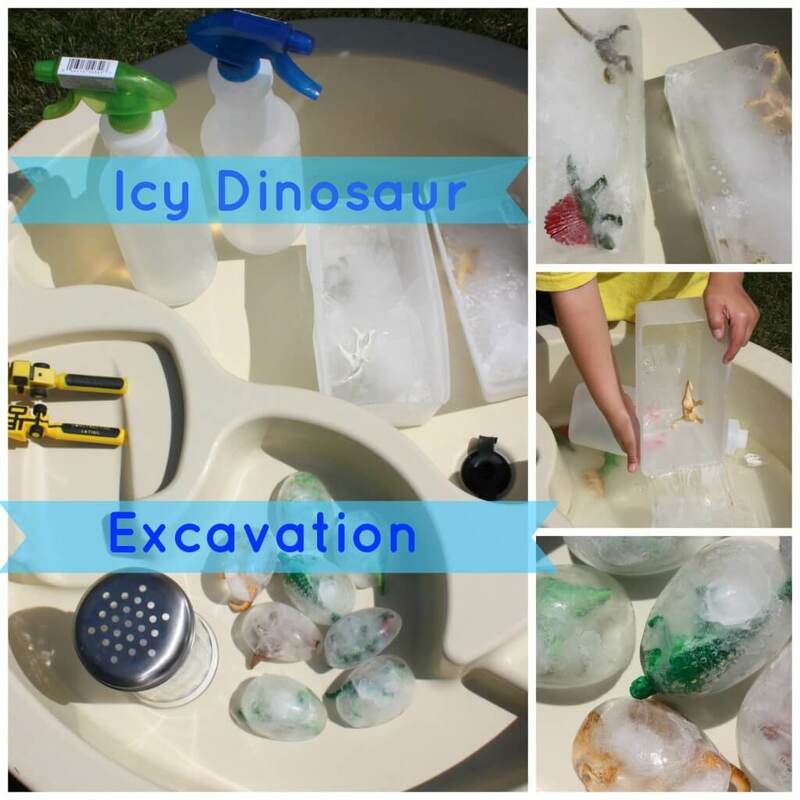 Hope you enjoyed our icy dinosaur sensory play this week! 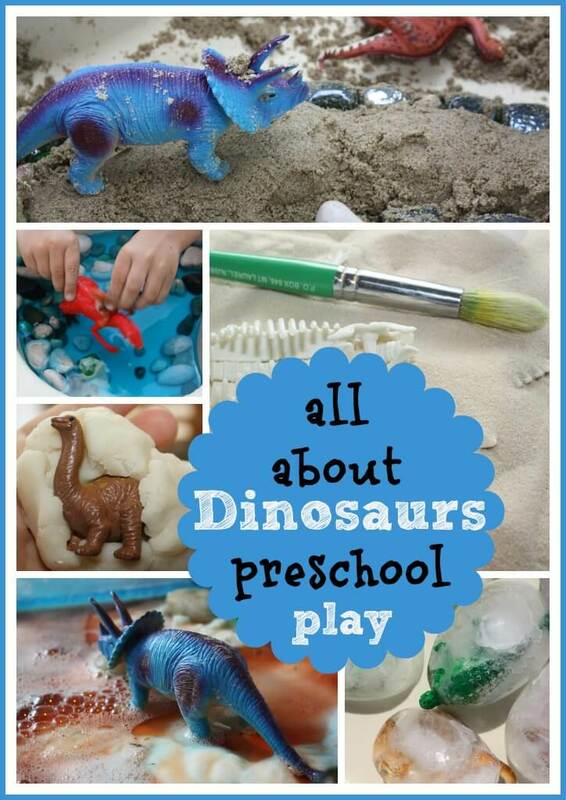 Check out all our dinosaur activities in one easy post! Very cool. There are so many great dinosaur activities. We could probably do a few more weeks but I will wait for next year! This looks like so much fun! It’s supposed to be warm today so I’m going to go freeze some dinosaurs! I love the idea of putting them in egg-shaped ice, too. Thanks for the idea! This is a great project! Love ice sculptures and the dinosaurs coming alive! So excited you found us! The ideas are all pretty easy to pull off. We ad about two weeks of dinosaur fun. 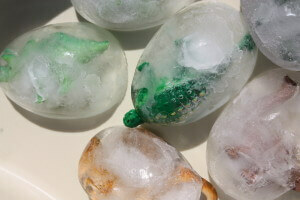 Those icy dinosaur eggs are so awesome! What a perfect activity for a hot summer day! Thanks for sharing it on the Discover and Explore linky! He thought it was the coolest thing when I pulled them out of the freezer on a hot day! Love this! 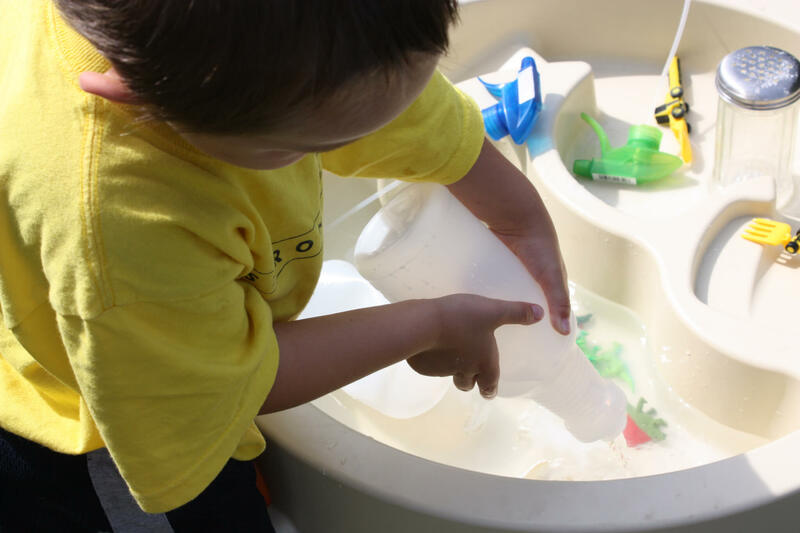 Great combination of sensory play and science! Thanks so much for linking up to last week’s Discover & Explore! Thank you! 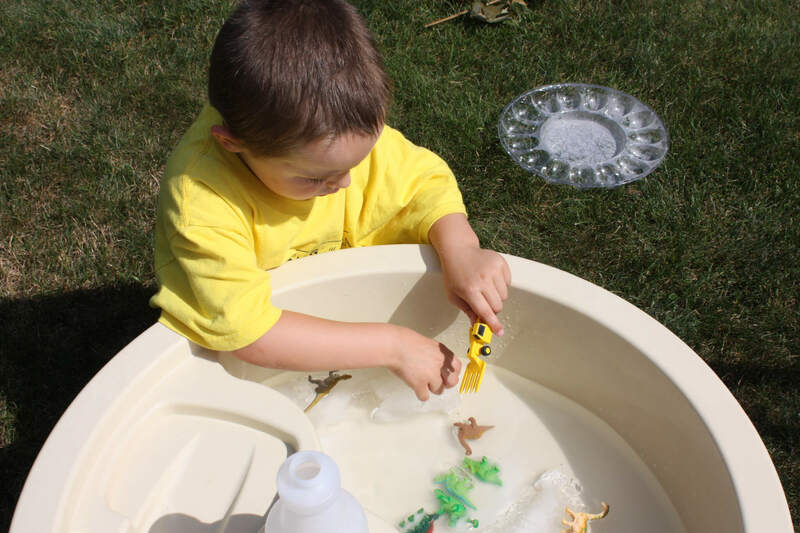 He enjoyed all our activities with dinosaurs and since it was still so hot out we had some natural help melting them! 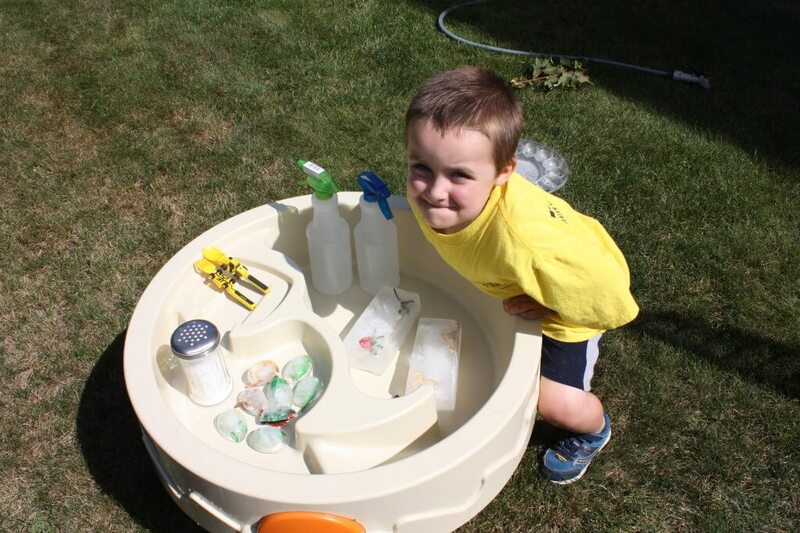 Where did you find the wonderful sensory table used in the dinosaur icy excavation? Toys R Us! 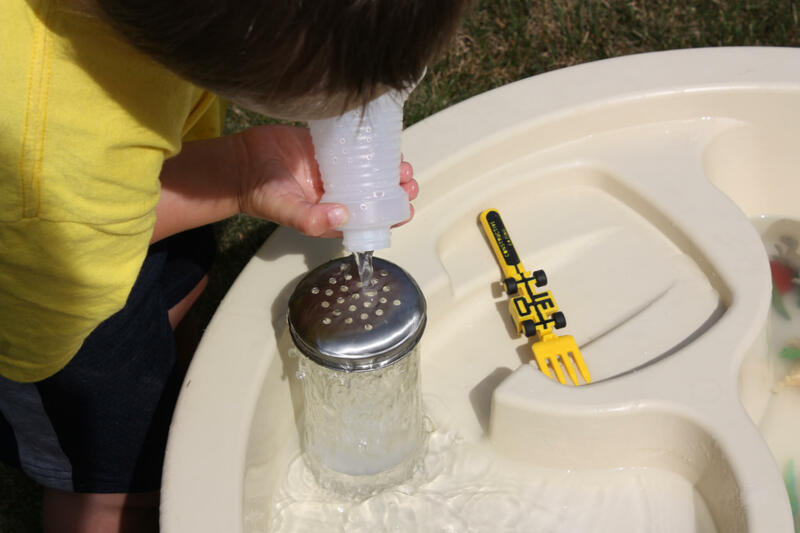 It’s a Step 2 or little tikes brand outdoor water table.